The KMPlayer ( also known as K-Multimedia Player ) is a video player capable to play almost all popular file formats. KMPlayer is video and audio player designed for Microsoft Windows can handle a wide range of subtitles and allows one to capture video, audio and screenshots. Also if you are going to use The KMPlayer you can slow down or increase playback speed, select parts of a video as favorites, set audio and video effects etc. ...... 3GP, RealMedia, MKV, and DVD. KMPlayer is video and audio player designed for Microsoft Windows can handle a wide range of subtitles and allows one to capture video, audio and screenshots. Also if you are going to use The KMPlayer you can slow down or increase playback speed, select parts of a video as favorites, set audio and video effects etc. 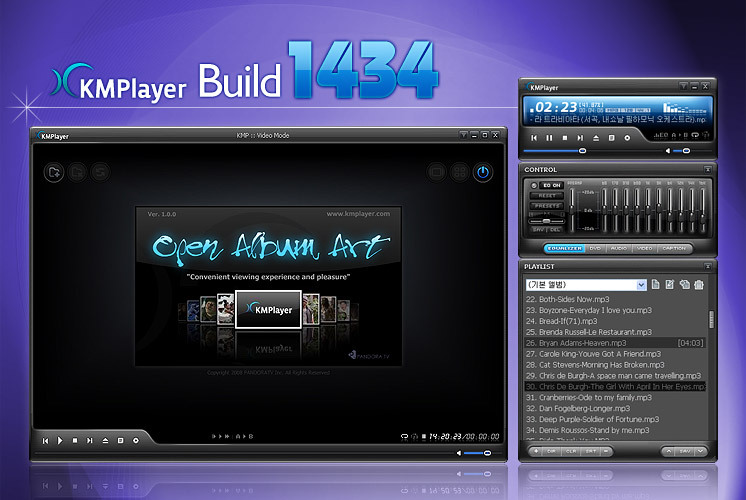 The KMPlayer is completely customizable thanks to a wide selection of skins and color schemes, and the configuration options are extensive. The KMPlayer is a free and easy to use media player. Qweas is providing links to KMPlayer 3.2.0.13 as a courtesy, and makes no representations regarding KMPlayer or any other applications or any information related thereto. Any questions, complaints or claims regarding this application KMPlayer 3.2.0.13 must be directed to the appropriate software vendor. You may click the publisher link of KMPlayer on the top of this page to get more details about the vendor.